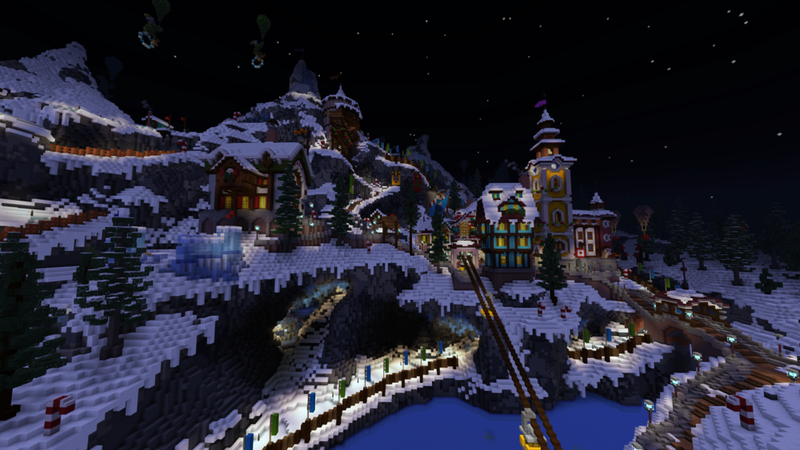 Christmas is an exciting time of year and we wanted to make the most of our opportunity to make maps for the Minecraft Marketplace and create some seriously festive stuff for our players. When we first sat down to plan our holiday content, one thing was for certain and that was that our Mini-Games Festival would be returning, and that it would be back with style! This time around we wanted to create something truly memorable. We really felt that we should push the boundaries of the festival and focus on creating a winter wonderland with a traditional Christmas theme, and so we looked to real world theme parks and attractions to fuel our creativity. One thing that we think is particularly important in any map is pathing; how the player gets around the map and the indicators that show them where to go. When we designed Winter Mini-Games Festival, we took a look at how Disney parks are designed, specifically the Disneyland Park in Anaheim. We took time to properly plan out the position of each sign, building and attraction to make sure that the player always has something to see or discover no matter where they are on the map. Our builders are re-building, altering and changing right up until the last minute with most of our projects; it's very rare that the first thing you build comes out perfect... even professionals make mistakes! We usually start with a "concept" of the build which is a basic outline that shows how much space we want it to take up and an idea of what it will look like. In the "before" picture you can see a couple of different versions of the Ice Castle in its early stages. This map's all about festivities and snow so an ice palace is the perfect focal point for the village. Because you can see it from most areas of the map, we wanted to make sure that it had enough of a "wow" factor, whilst still sticking to our theme. Lessening the size of the towers and adding more rustic pathways helped to integrate it perfectly into the winter village while keeping that fantasy, festive feel. Designing a map isn't just about the build! A huge amount of our time and energy goes into the smaller details such as textures and other environment changes like sounds and custom 3D models and mobs to our maps feel like you're exploring a brand new world. We have two amazing artists, Skyao and Arsenic and you'll see their work in every single one of our maps! Between them they work tirelessly to build models, change textures and create all of the artwork that you see on the marketplace. The pictures above show the progression from concept art to the final 3D model and how it looks in game. 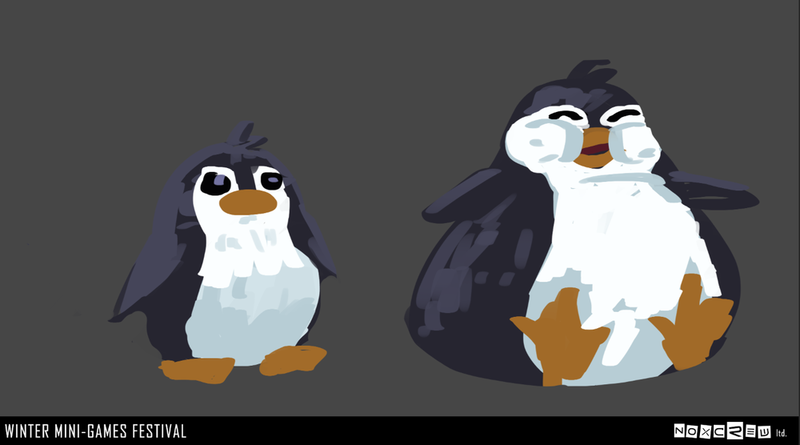 You'll find these cute little penguins wobbling around the festival. OG fans of Noxcrew projects may recognise one of the mini-games in this season's map from the hugely popular Noxcrew Gameshow! This particular mini-game made its debut back in 2015 during Gameshow Season 1 in the semi-final between Team Shed and Evac Crew. The Noxcrew Gameshow was created in 2013 where it was formed from our love of all things mini-game and inspired by TV shows from our childhood such as Jungle Run, Takeshi's Castle and our personal favourite, Crystal Maze. Every episode of the Noxcrew Gameshow is still available to watch right here on YouTube or head straight to the Yeti-Set-Go episode by clicking here! Fun fact: as if navigating the ice-track wasn't tough enough, the original version of the mini-game had zombies running around the track dressed as snowmen and shooting at you to make things all the more difficult. As a final little treat, here's an amazing example of the reason that Noxite is better at creating maps and adventures than artwork... Perhaps we'll leave the key art making to Skyao in the future. Although, surprisingly it looks a lot like the final product...!